This past weekend I headed out to Phoenix to spend the weekend with my family at the NHRA Lucas Oil Series event at Firebird Raceway in Chandler, AZ. It had been more than three years since I participated in a NHRA drag racing event, so I brought my camera along to document the weekend. There is a lot of pressure being in the Jim DeFrank & Sons racing pit area. My brother, Jimmy, is the reigning NHRA Super Stock national champion. It was his 4th national title in the Super Stock category. I never won a national championship while driving, so I had to try and not embarrass him or the team while I was out there over the weekend. I drove Jimmy' s 1969 Chevy Camaro in the Stock Eliminator category at the race. The big block Camaro ran in the 10.40s at 127 mph over the weekend. It is a fun car to drive and runs great. 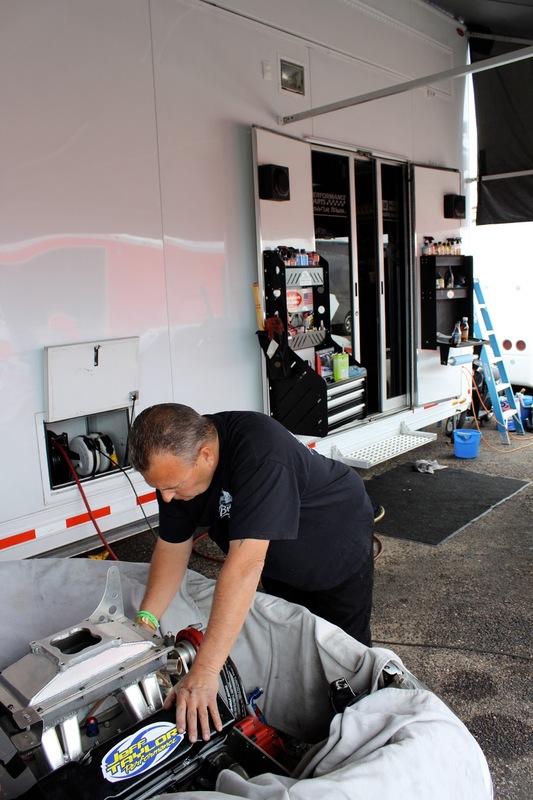 Jimmy and his crew chief, Davey Allison, performed some routine maintenance on Jimmy's Chevy Cobalt during qualifying. The Chevy Cobalt goes down the quarter mile in the high 8 second range at over 150 mph. I offered to drive the vehicle for Jimmy at the race, but he quickly declined for some reason. What made the weekend unique was that NHRA decided to host two divisional events in one weekend. Basically, one eliminator was run on Thursday & Friday and another one on Saturday & Sunday. It gave racers two chances to win while only making one trip to Arizona. Jimmy competed in two categories at the first event and sat out in both of the second. I raced the Camaro at the second event. Above is a photo of Jimmy racing the Camaro during the first race of the weekend. He made it to the fifth round of eliminations before losing a close race. 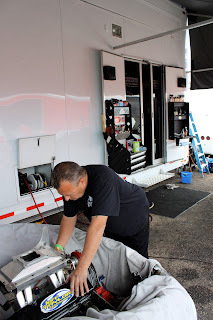 After eliminations closed at the first race, the team discovered a few problems with Jimmy's Chevy Cobalt and decided to skip the second race. The team's next event is not until April, so it will give Jim DeFrank & Sons Racing plenty of time to get the car in order. Never a good sign, when you remove an engine from the car at the racetrack. Follow along on the blog as we will continue to have coverage from local automotive events. Stay connected with California Car Cover on our website and on Facebook.